You guys do so many fun things together!! It's awesome!! I love the picture of all of you in China Town!!! What a beautiful family! Looks like a fun trip. I love the picture of all of you at the baseball game...very cute! You guys should have come down our way last weekend and gone to "Mormon Night" with the Angels. They even played the Braves...Matt would have loved that. Kristen- Hook us up with some cheap tickets and your on! I love the exploratorium. 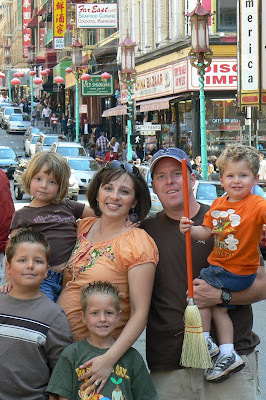 We took Micah and Jacob there when Micah was about 4. He yelled really loudly at least 3 times that a man there sounded like a woman. The man was so not laughing. We saw an A's game. I love your blogs!